Hey everyone! I hope all is great. I finally found some time to create my own social media icons. This is actually my very first "freebie", so I'm hoping you'll all like it! I'm planning to add some more but in different styles. 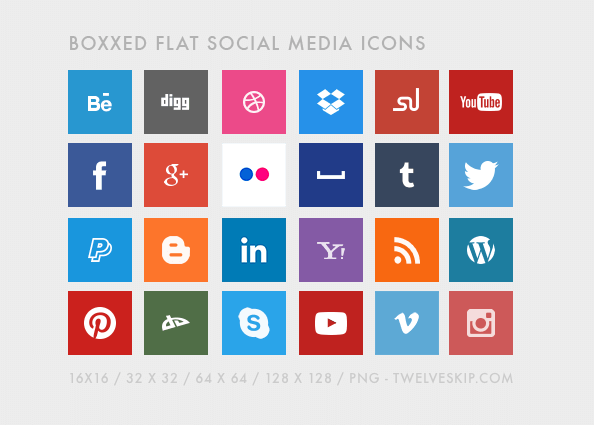 For the mean time, please enjoy these free flat social media icons which I call "Boxxed". There's 24 icons in this set including the most popular social networks: Instagram, Youtube, Skype, Pinterest, Deviantart, Blogger, Youtube, Vimeo, Wordpress, RSS, Yahoo!, LinkedIn, Google+, Facebook, Youtube, Stumbleupon, Dropbox, Dribble, Digg, Myspace and Behance. It comes in 4 different sizes: 128px X 128px, 64px X 64px, 32px X 32px, 16px X 16px. All in PNG format.